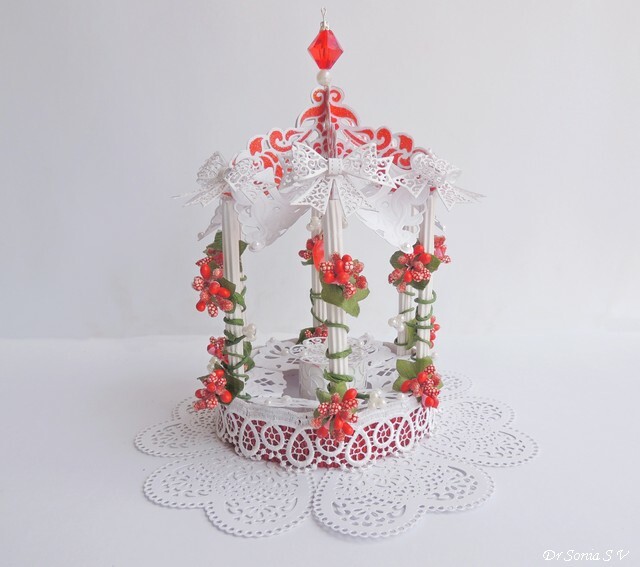 Dear friends I have been fascinated by Gazebos for a long time and wanted to make a 3 D Paper Gazebo .The Paper Gazebos I saw online were all made using SVG files and since I dont have an electronic cutting machine ,improvised and made one using die cuts and paper rolls. 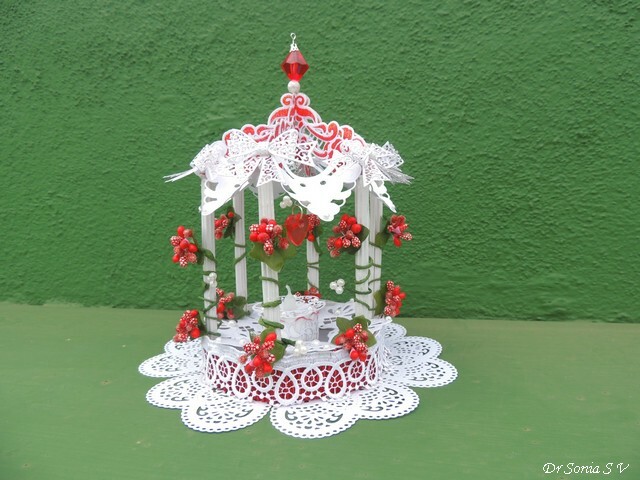 My 3 D Gazebo is big enough to house a little doll.It can also be called a Bird house or Lantern as it houses a battery operated tea light. 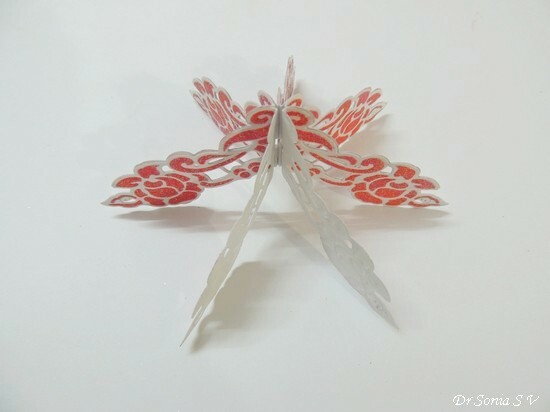 Making any 3 D structure in paper looks deadly complicated but its completely do-able if you break it down into parts! And though I used die cuts to make the roof of my 3 D Gazebo, you can make one without using any fancy equipment! 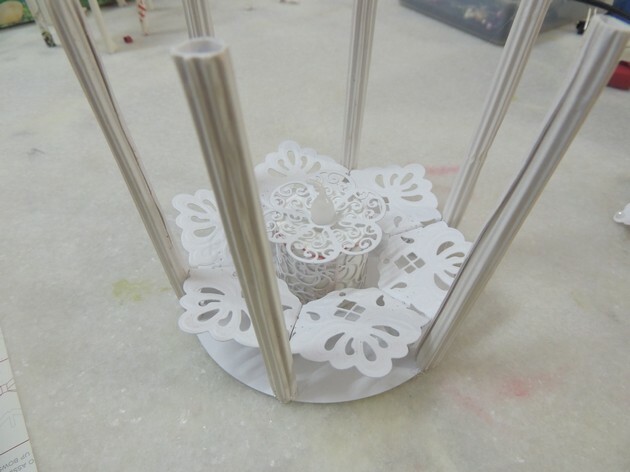 Conical Dome:The easiest way to make the dome of the Gazebo would be to cut a thick card into a circle and glue it in a dome shape- you could decorate the rim of the cone with lace and pearls and it would look spectacular! 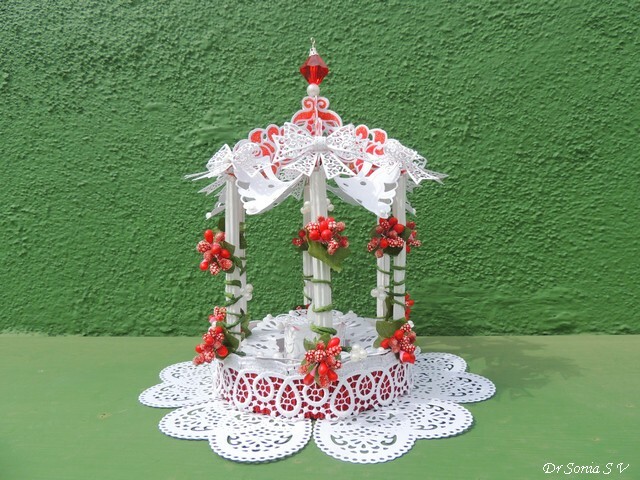 Slanting Roof: You can adapt the roof I made for this Wishing Well to make a Gazebo roof too! 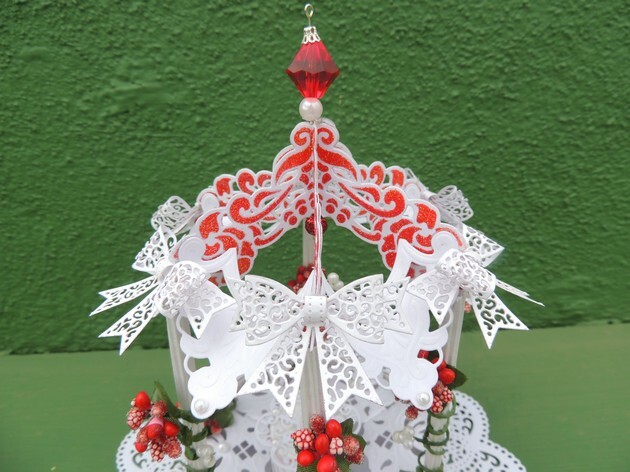 I used the same Marianne Petra Corner die set I used to make the 3 D Chariot. 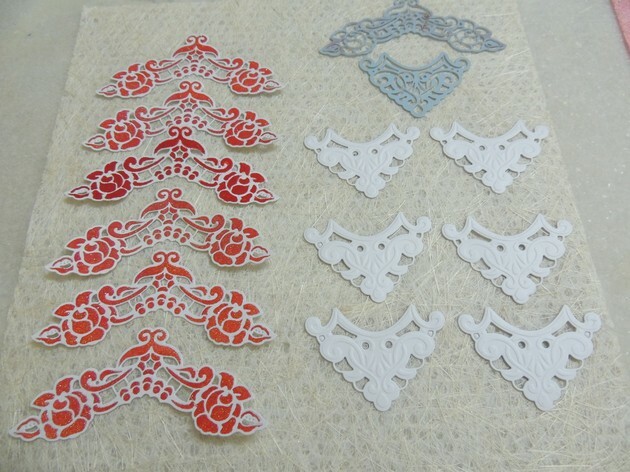 You don't really have to use the same dies I used-- just try playing with whatever die cut shape you have on hand or hand cut a shape you fancy. 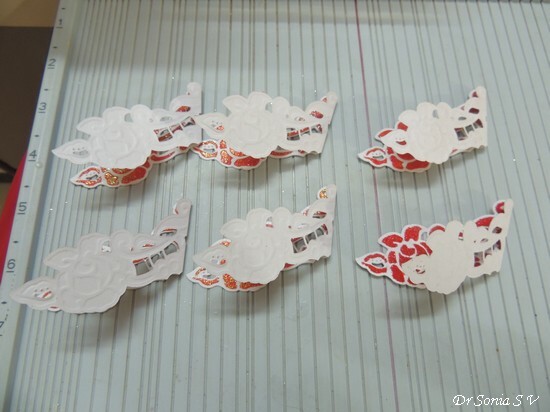 The picture above shows how the die cut looked before I inked it and heat embossed it with WOW clear sparkle embossing powder as described in the 3 D Chariot making post. Stick all 6 pieces and your dome is nearly done.You get a fairly lovely shape even if you use only 5 die cuts but I found working with 6 made the rest of the 3 D construction easier [ like placing the pillars] ! 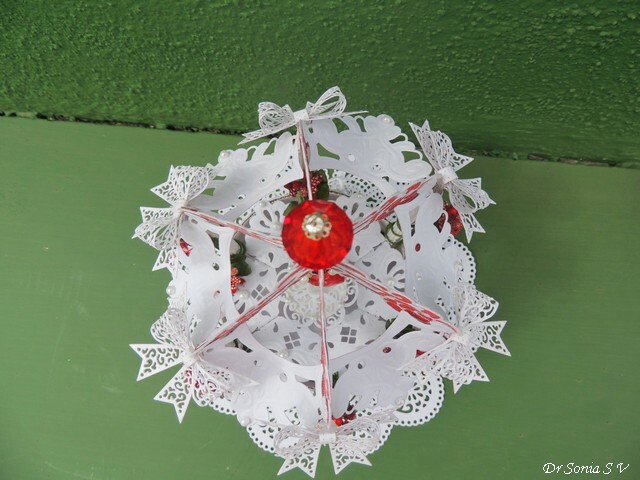 Before you stick the last 2 pieces, add a hook if you plan to hang your lantern. I used a long jewelry finding and threaded a large bead on one end and made a hook on the other end.Later on I added a dangling heart to the hook on the inside and a pearl- ruby to the hook on the top. 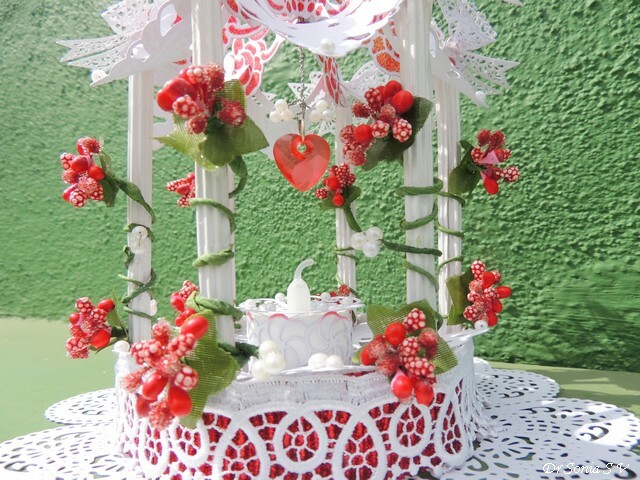 To complete the Gazebo roof, I used the Marianne die cut shown below which was again a bit plain on simply die cutting it but on embossing with Spellbinders embossing pads revealed beautiful embossed designs!It looks rather plain doesn't it..well instead of inking and embossing , I took a shortcut! I know many of you will be already knowing how to emboss your die cuts with the Bigshot/Cuttlebug...well this was the first time I did it ! So but sharing the embossing steps in case you didnt and remember its yet another way to explore the maximum potential of your dies! After you have cut the die. 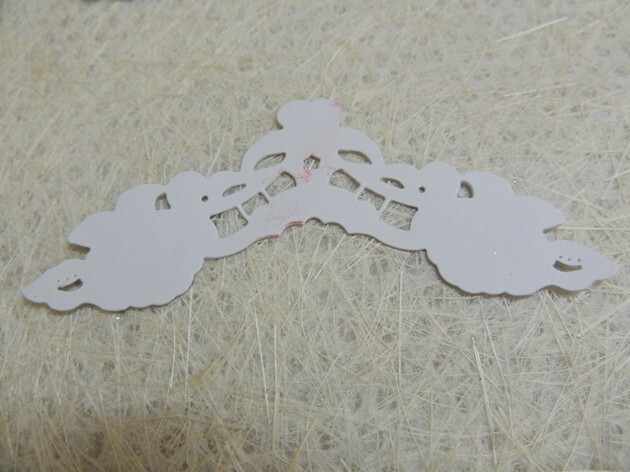 keep the dic cut paper within the die itself [on your acrylic cutting plate]and place a Spellbinders Embossing pad atop it and then your other cutting plate. 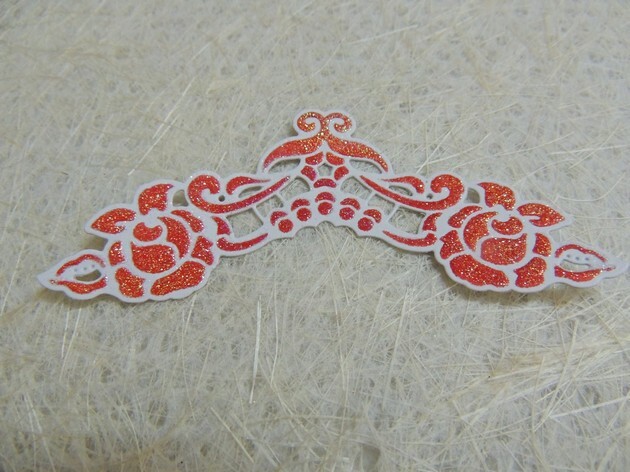 Just one run through your big shot and you will get beautiful embossed impressions on your die cut as shown below. Before I got the embossing pad, I tried to emboss die cuts with thick felt and even foam-- I did manage to get some amount of embossing but my foam/ felt spoilt and disintegrated real fast and on comparison the embossing was not as deep and beautiful as what I got using the proper Spellbinders Embossing pad. 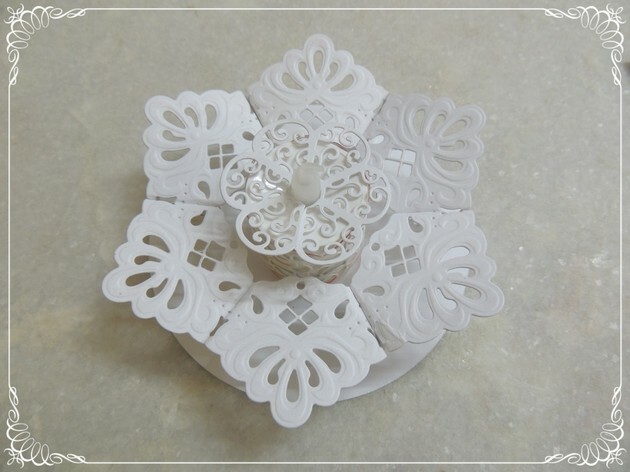 There are many embossing pads out there but I hear the Spellbinders one is the best! Attached 6 of the above die-cuts between the arms of the basic frame made earlier to make it more sturdy.Here is the aerial view of the Gazebo roof showing the pretty dies and bows. 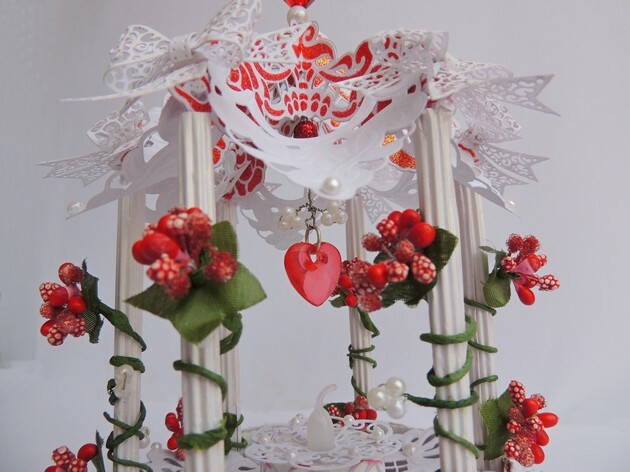 Here you can see the dangling heart and pearly beaded sprays [See Easy Beaded Spray tutorial ] hanging from the center of the Gazebo roof. Make the base of your Lantern / Gazebo to match the shape of your roof. The easiest shapes are simple squares and circles. 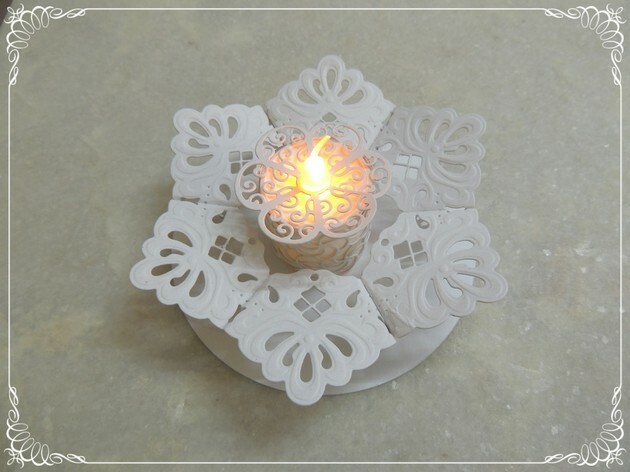 Here is how the tea- light looks when it is lighted up. 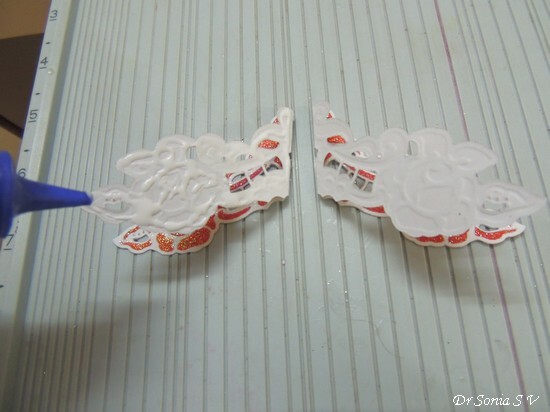 You can stick the circle of card on a thick cardboard or even a CD.To make the base even sturdier, after adding the pillars ,wrap a piece of corrugated paper around the pillars along the circumference of your circular base. You could use strips of card folded at right angles to make the supports but I found it easiest to use rolls of corrugated paper as pillars. Corrugated paper is super easy to fashion into rolls. I used 1 inch width corrugated card , cut 6 pieces into lengths I wanted and rolled them up tight to form pillars.Stick the pillars on the circular base and on to the roof of the Gazebo. 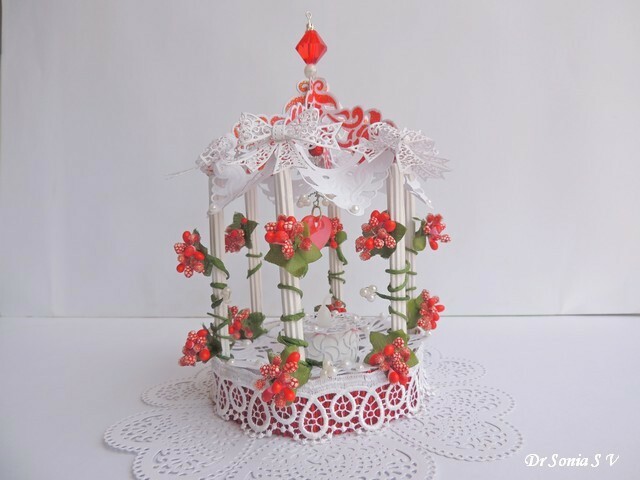 Tip to make 3 D Paper-crafts : Obsessing a bit about symmetry, gluing and re-gluing is the key to building a good looking and sturdy Paper Lantern/Gazebo! Working with 6 eg :6 spokes on the roof, 6 pillars, 6 sides etc makes it easier to build a symmetrical 3 D structure than working with 5 ! 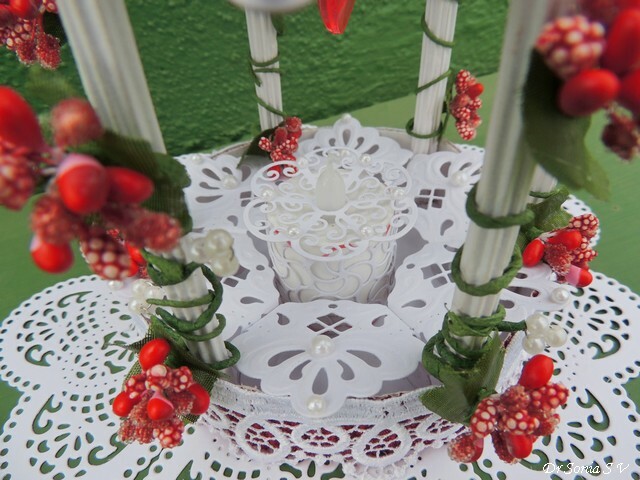 The delicate lacey bows I used on my Gazebo are Sue Wilson dies from Crafters Corner. I do hope you enjoyed my first DIY Lantern ,and hoping some of the principles shared will come in useful to help you make your own Diwali /Christmas Lantern for the upcoming festive season. 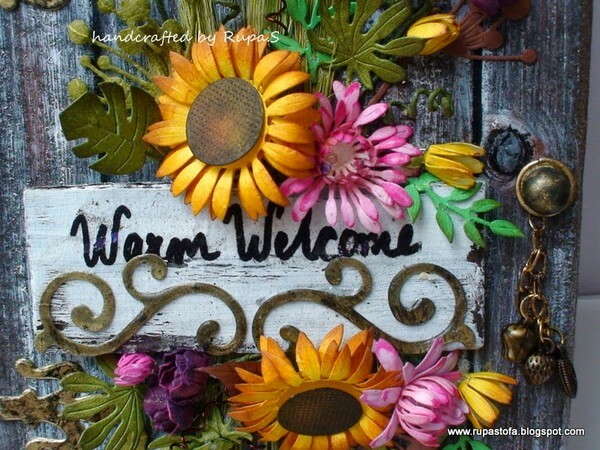 Dear friends Thank you so much for the fantastically warm response you gave to my friend Rupa's Wood grain tutorial ---that is what I like best about blogland- the way we support and encourage each other! Sorry I have not been around to visit....I had an extremely busy week last week with a huge patient load and my usually good time management skills went for a big toss.I feel so bad for letting down the Tuesday Throwdown team as I couldnt make my Guest DT project for them this week. Sharing a simple Photoframe my daughter and I had made as a Teacher's Day gift. Altered a desktop calendar like in the earlier DIY Photoframes I had shared and this time added foam flowers. Made the foam flowers using a favorite Cheery Lynn Sunflower die using this tutorial : Easy Daisy tutorial . 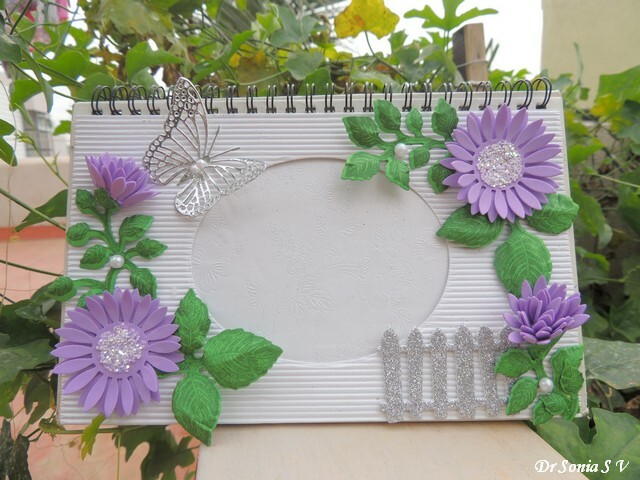 I love using foam to craft as it doesn't crush and this was a special advantage in this photoframe as I didn't have to worry about the flowers getting crushed while the handmade photoframe traveled to school! 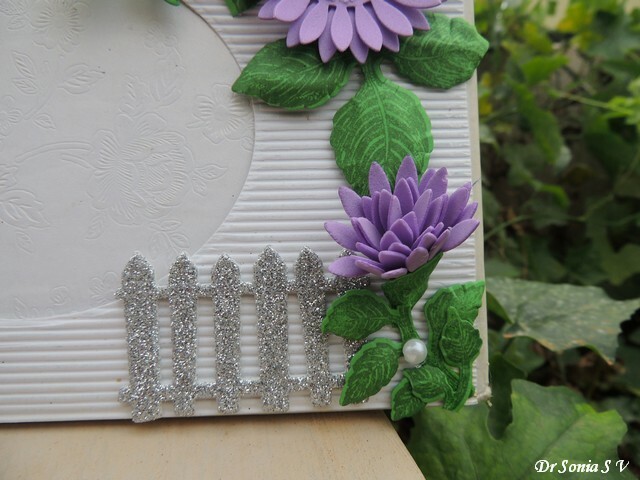 We used chunky glitter on the center of the purple flowers and added Heartfelt creations stamped and die cut leaves. 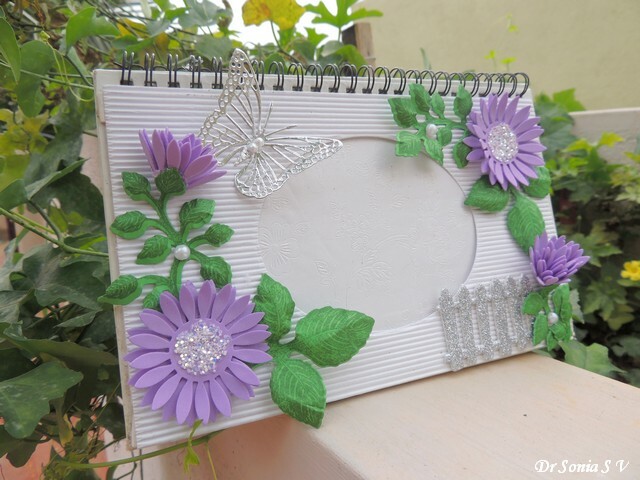 This was a super simple Photoframe churned up in minutes! Dear friends this is a super exciting post ....most of you know my love for recycling ---not only do I enjoy to do recycling crafts,I get super excited when I see other crafters do it! 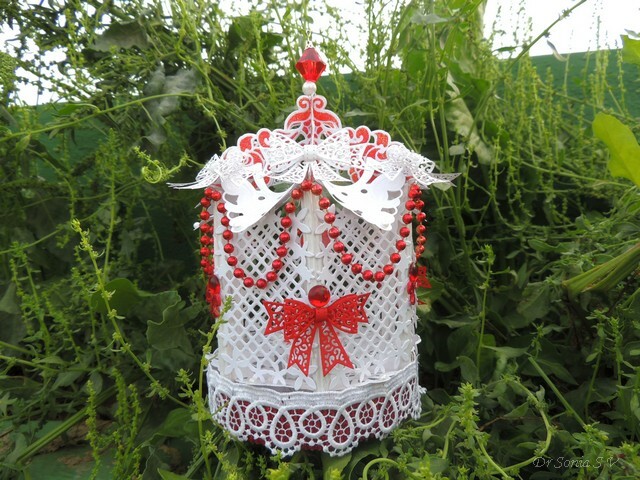 I have featured 2 other talented Recycling Crafters in the past [see Guest Posts on this blog by Khadija and Katy] and today I am thrilled to have the super talented Rupa [of Tofa- Together for Arts]as my Guest. Rupa is an artist + crafter [a deadly combination!!] 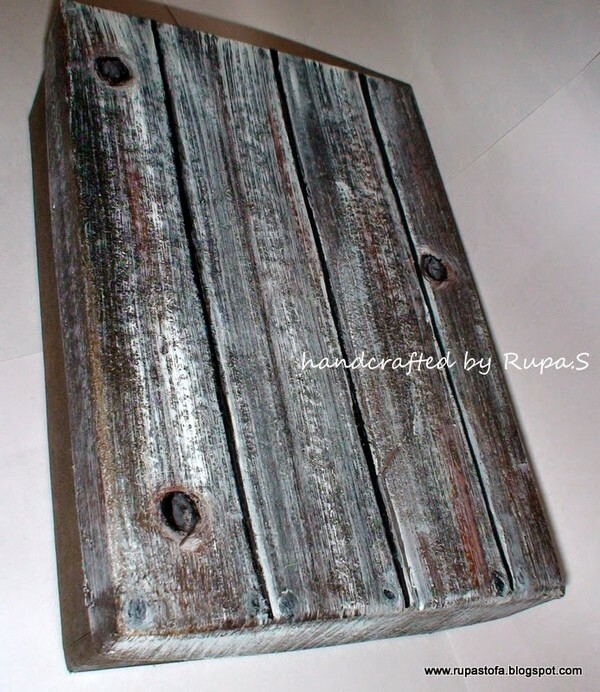 and she is here to share with you how she made the gorgeous Faux wood texture on the shoe-box she recycled! I am Rupa from Bangalore(India).I feel so honored and excited to be a guest today in Sonia’s blog. We live in the same city and share the same passion for “ Re cycling”! Most of my projects have an up cycled item and they are all altered projects. I was so overwhelmed by the great response to my “Creaking Door” and the icing was when Sonia asked me to do a tutorial on how to create the wood grain texture or the “faux wooden log”. It gives me great pleasure to share the technique with you all. Thank you Sonia, for this opportunity to connect with your bloggy pals. It’s quite simple and the materials required are just a handful! Step 1- Spray black acrylic paint on the cardboard randomly leaving a few brown patches. It can be just one layer of paint and need not be too dark. Step 2- The grains are created using the dry brush technique, so keep them dry! Squeeze some black, brown and white paint on to your palette. Using the big flat brush, dip the bristles onto white paint and tap excess. Load the paint only at the tip and now give a couple of strokes on the surface till the paint fades. You will notice a natural rough texture because of the dry technique. Step 3- Clean the brush and dry completely. Load black paint at the tips and do the same as step2, overlapping on the white strokes. Step 4- Now load brown paint and do just few strokes here and there. Wait for the surface to dry. See the layers build up! Step 5- To create the knot holes on the log- load white paint in one corner of the flat brush and rotate clock wise at one spot. Follow with a touch of black too. Step 6-Now take the thin round brush and load black paint and draw lines on the card board at regular intervals of say 1.5 inches. Once that dries, dry brush white paint on both sides of the black line so that the black “pops up”! This will create the illusion of space between the logs! At any point you can go back to step 2 and continue if you are not happy with the look. It is quite forgiving that way. Your wooden plank is ready for the project. Look at what I did to it!I painted the lid of a shoe box to create a door and embellished it too. Have a look at this project " The Creaky Door" and do let me know if this tutorial was helpful. Hope to see a lot of “Loggy” creations from you all. Do drop a comment on my blog if you have any other queries. Wasn't that just AMAZING...!!! !....And that was just a teaser about Rupa's talent. Please do drop by her blog Tofa- Together for Arts to see more of her work and I assure you , you wont be disappointed! And if you are in Bangalore-- you can actually learn lots of tips and tricks from Rupa in person as she regularly conducts some amazing craft workshops. Dear friends ,Thank you so much for the wonderful congratulations [on Facebook and my blog]!! For my Guest DT project at Tuesday Throwdown , I was sent a beautiful colored picture called Spring Blocks from Deedee's Digis featuring lovely crocus flowers and had to use it to make a project in the theme “Bows and Butterflies”. I wanted to highlight the image and tried out a “Faux Tile” technique [inspired by my most talented blogger friend Valerie Ann aka Mrs A]. Most faux tile techniques involve cutting the image into squares and adding glossy accents for the shine. In my country [ my Indian crafty friends will agree I am sure], its not easy to get craft supplies and so most of us hoard our supplies like crazy! I have been managing with a small bottle of glossy accents since 2 years and I didn’t have the heart to finish it on one project! So used a different Faux tile technique!Scored the image every inch , sponged it all over with Versamark watermark ink , poured clear sparkle embossing powder on it and heat embossed to get this beautiful sparkling and textured tiled image! And my favorite Embossing powder which you may have guessed is the WOW Clear Sparkle! 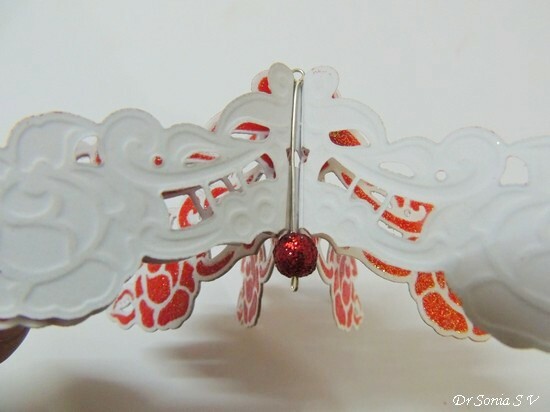 Made a background by layering Spellbinders Borders and adding my favorite Cheery Lynn butterfly and a glittery foam bow. This was one of the rare times my husband noticed my card and said it looked beautiful ! But my usual supporter in crafting, my 8 year old daughter said " Its Okay" !! So I dont know...I think I have to leave it to my blogger friends to tell me how it is!